Well, it is officially Spring, although if you look outside my windows you would think otherwise. This has not stopped me from sewing my spring wardrobe. Today I bring you a gorgeous Fashion Star design from McCalls 6554. I love this dress so much, I can already picture all the different fabrics that I can use. Although the colours look more like "fall", the big flowers remind me of Spring. Pattern Description: Dress has close-fitting, lined bodice, raised waist, skirt with front pleat/underlay, side pockets, self belt and invisible back zipper. Were the instructions easy to follow? Yes, the instructions were easy to follow and well-written. What did you particularly like or dislike about the pattern? I like the whole dress. I loved the front pleat and underlay. With the instructions came drawings of various ways to alter the dress to make it into a tunic, a maxi dress for a formal affair, using a different fabric for the underlay. The possibilities are endless. Fabric Used: I used a lightweight printed cotton which is so bright and vibrant. Pattern alterations or any design changes you made: I was so excited that I did not have to make any adjustments to the pattern. I simply shorten it by 3" to account for my petite stature. Although the pattern only had the bodice lined, I lined the full dress because of the thinness of the fabric. 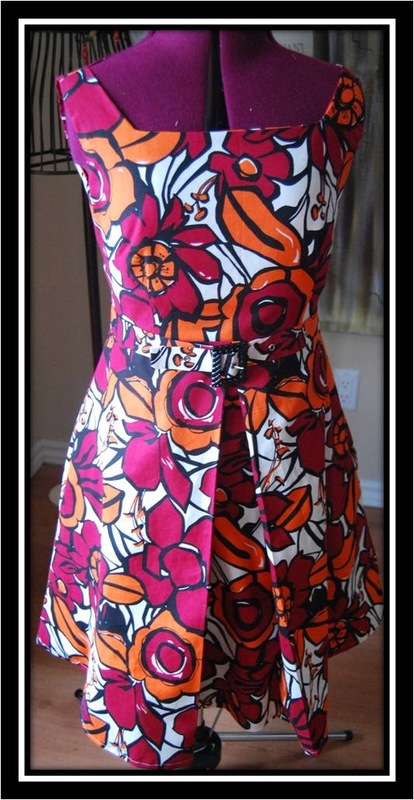 I used the same fabric to create the lining as the dress. The dress comes with a belt but I created a self covered belt and used a buckle I had to create the finished product. Now that I know how to make a self covered belt, I am obsessed with creating them for each of my summer dresses. 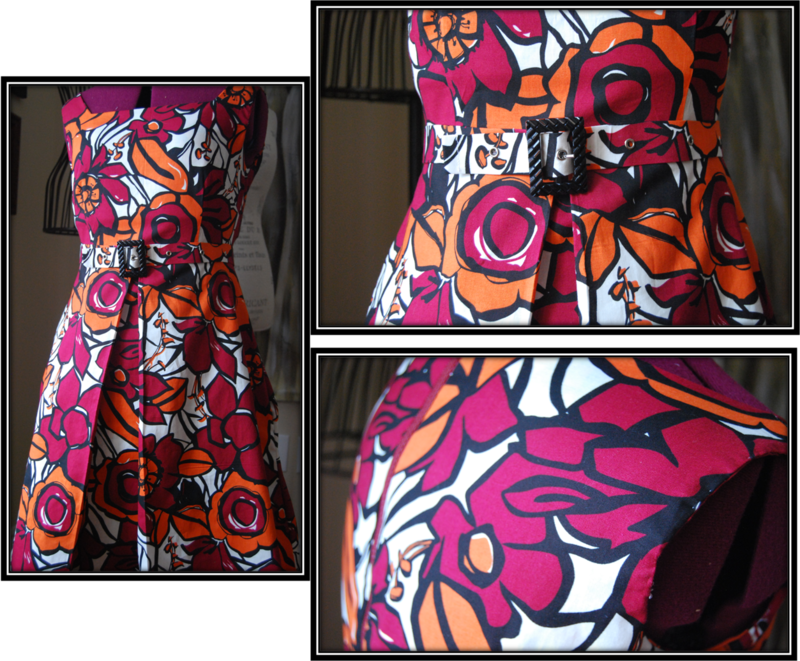 The pattern called for an invisible zipper but I thought it would be fun to use an exposed zipper in a matching colour. Would you sew it again? Would you recommend it to others? Absolutely! This dress was quick and easy to put together. The fit is fantastic and required little adjustment. The versatility of the dress is promising. Conclusion: Love this pattern, love this dress! This is beautiful! Love your fabric choice. I love this dress!! Especially the fabric you chose. Great work! Thanks Patricia. I am really getting into the bright bold colours! 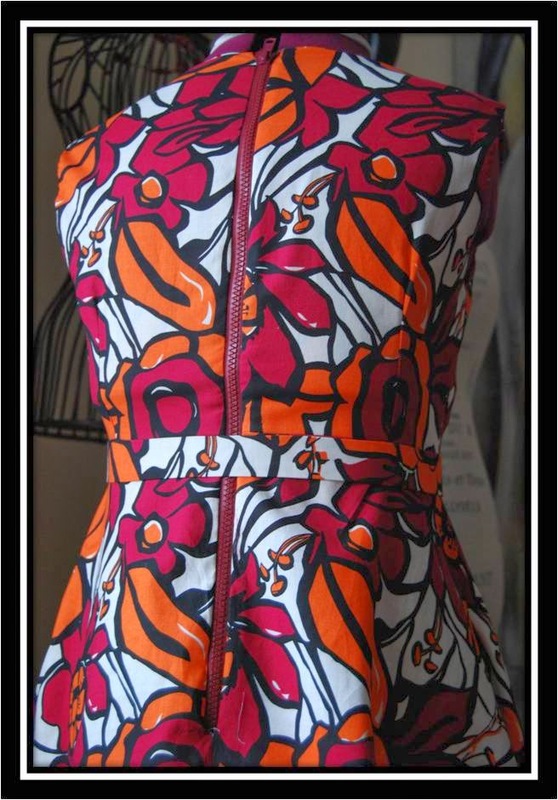 Great print placement and work on this dress, it looks like it'll be a fabulous dress for spring! It is a beautiful dress, I think the colors are great for spring myself. Hoping you get to wear it soon, spring has to show up some time, doesn't it?